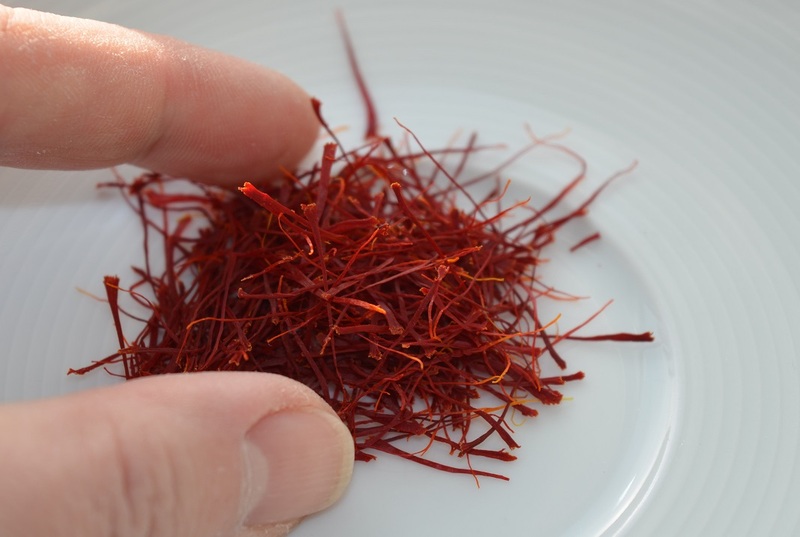 If you’re thinking about unusual crops in 2017, saffron and yacon are brilliant. 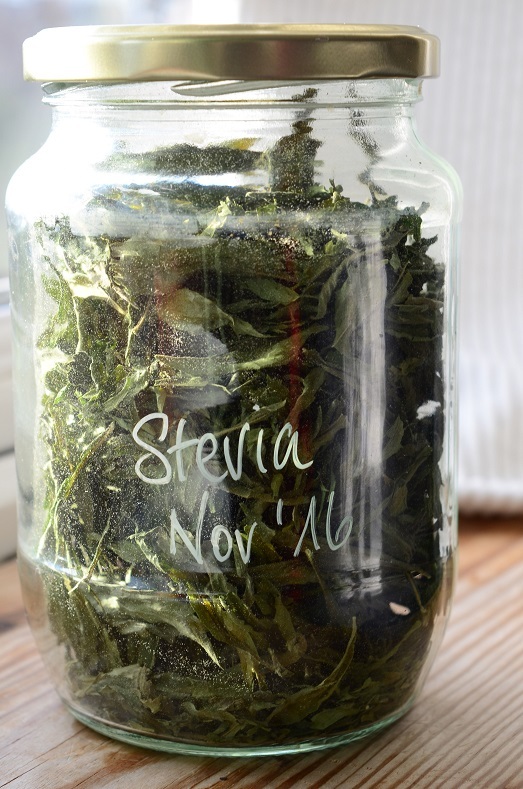 Stevia is just weird. My 3rd saffron harvest has finally been weighed and packed away. It weighs………0.9g, so with twice as many corms in 2016 I ended up with a slightly smaller harvest than in 2015. 2016 wasn’t a very good year for many of my crops and this is no exception. I think I put the corms back in too late, plus it was a very dry autumn. Certainly the stigmas I picked were often shorter and thinner than usual. To add to the woes, I missed quite a few days harvesting because of work. Still, 0.9g is 0.9g and that will make a good few risottos, ice creams and poached pears until it’s time to go picking again. There are some intriguing recipes for saffron and orange marmalade challah and Swedish saffron buns which I quite fancy trying. Green powder is the end product of my stevia plants. I picked a big bag of leaves, which then spent a good few hours in the dehydrator. 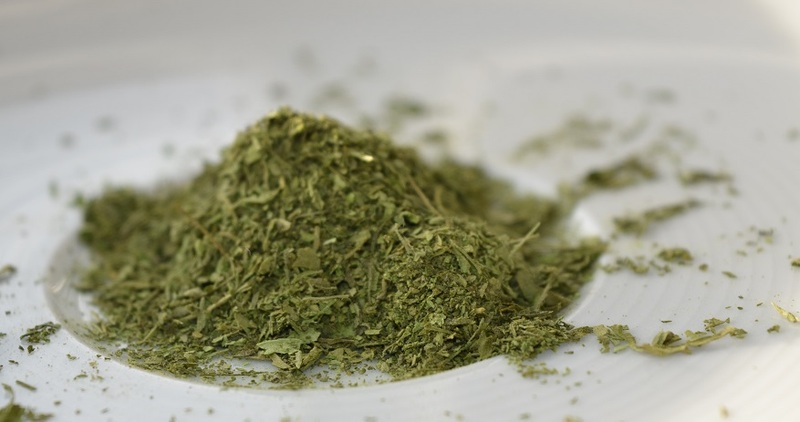 They filled a large jar with crispy dark leaves to begin with, then after a recent session in my coffee grinder, a smaller jar of very sweet green powder. 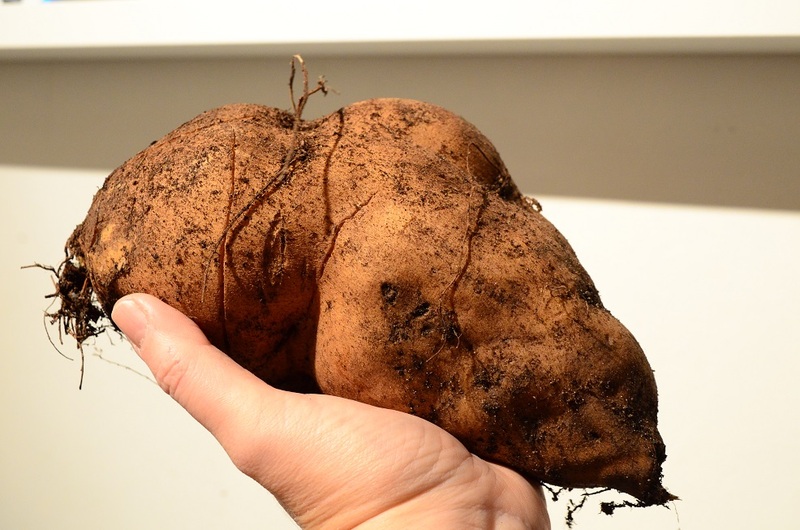 Yacon, on the other hand, is now on my ‘must grow’ list. I had a phenomenal harvest at just over 10kg from one plant a 40L tub. I may have said this several times…! As a comparison the Thompson & Morgan blog estimates each plant yields about 4kg. The tubers are lovely and crunchy to eat raw, like sweetish waterchestnut or pear. They taste fabulous on their own or in a salad with sharp cheese and nuts. The pale tubers oxidise very quickly and need to be put into lemony water as soon as they are peeled. One warning though – like Jerusalem artichokes, some people get rather windy if they eat a lot. Thankfully I’m not one of them. One of the most common suggestions is to make yacon syrup, so I thought I’d give that a go with the biggest tubers. The syrup costs eye-watering sums online – £10.42 for 170ml as an example – because it’s being touted primarily at people who want to find a sugar substitute. And if I’m honest, that was part of the attraction for me. Gally loaned me her juicer and off I went, peeling and pulping and covering the kitchen in green juice/peel fragments/blobs of pulp. 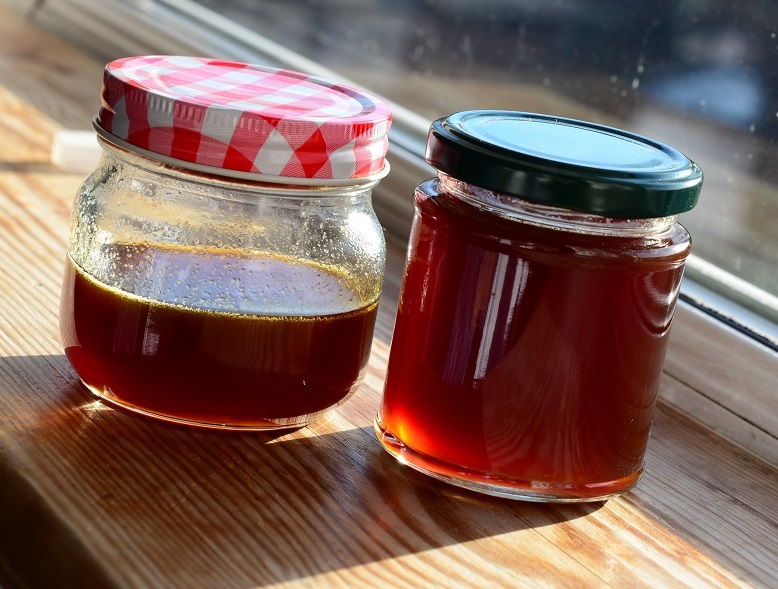 The resulting 3.8 litres took hours to reduce, turned the kitchen into a sauna and, after all the straining and skimming, eventually made just over 300ml of thickish syrup. I probably could have reduced it further, but it was starting to stick on the bottom of the pan and I didn’t want to burn it. Not after all that effort! It tastes lovely. Like a malty treacle, and I bet with a bit of vanilla and cocoa mixed in it would be heavenly. 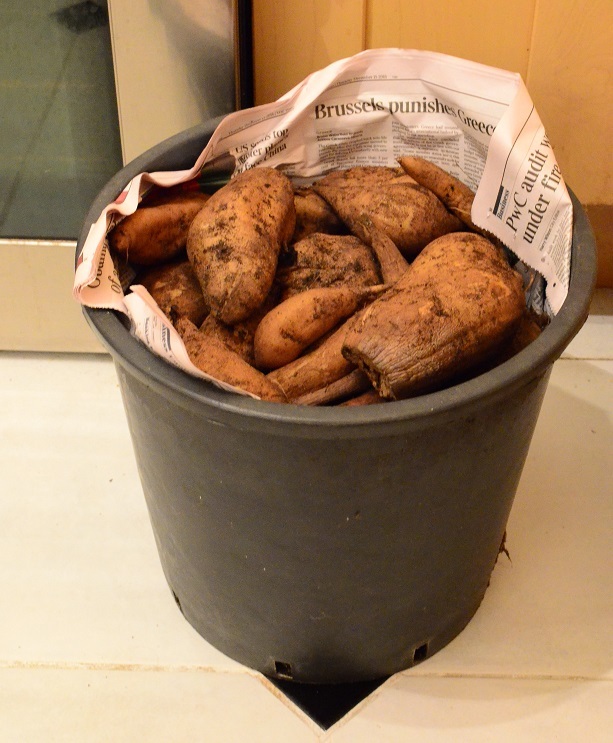 I have perhaps 4kg of tubers left – the ones that are an awkward shape/size. 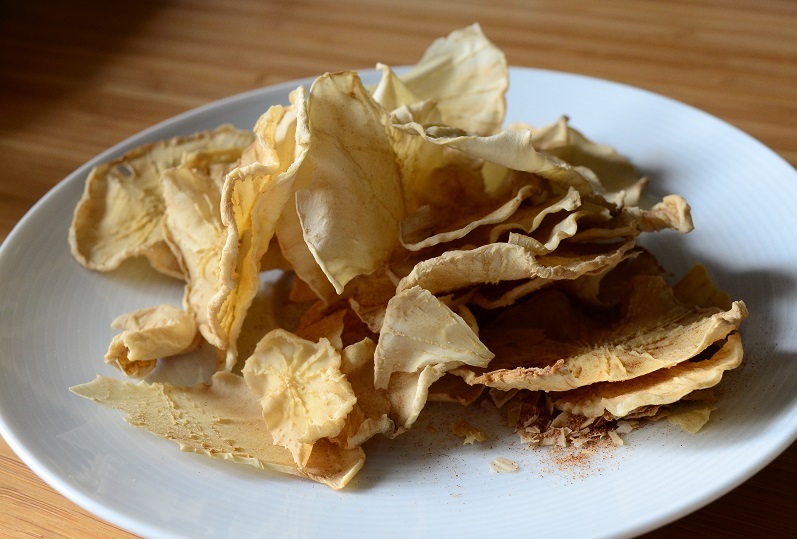 I could make more syrup, after all two tiddly jars won’t go far, but there are also yacon crisps…Dehydrated yacon is sweet and bland. The bonus is that it takes flavours really well. I’m going to trial more, but so far lemon sprinkled on before drying works well, and half a teaspoon of cinnamon shaken into a jar of plain dried yacon slices is just wonderful. Perfect for January ‘abstinence’! It begins with 2017’s chillies: deliciously dangerous! Mint and Stevia tea is really pleasant, at least I found it so. Just infuse them together 505/50 like you would any other herbs, I wasn’t aware of the aftertaste that you get from eating it. Thanks Tim, I’ll give that a try when my mint resurfaces. I’m glad to have something recommended that I can try with it! Yacon is on my new-for-2017 list, along with oca, ulloco and skirret. Which reminds me, I must get my orders in. Glad you grew them in a pot Beryl, they are a complete sod to dig them out of the ground Lol. Yes I bet they would be! I was surprised at how brittle the massive tubers are. I snapped a few just lifting the crown out of the compost. Am not going to grow them in my sticky clay, but I definitely want to have more of them this season. How have they done for you? I only grew a few this year , a couple in pots and a couple on mounds which worked out very well.I reduce my liquid down in a slow cooker with the lid left open a bit, it takes longer but the kitchen is not like a sauna.. O and yes if you reduce to much it ends up like hard toffee. mind you it makes good sugar. more like palm sugar I would say . Interesting to hear the comparision of stevia and yacon, which are both crops that are on my to-do list. Thanks. I know taste is subjective, but Stevia really is pretty horrible. Yacon on the other hand, is lovely raw, dried & syruped. I’ll definitely try it, but I doubt I’ll bother growing it again unless the steeping is a real revelation! It was a nice experiment though.